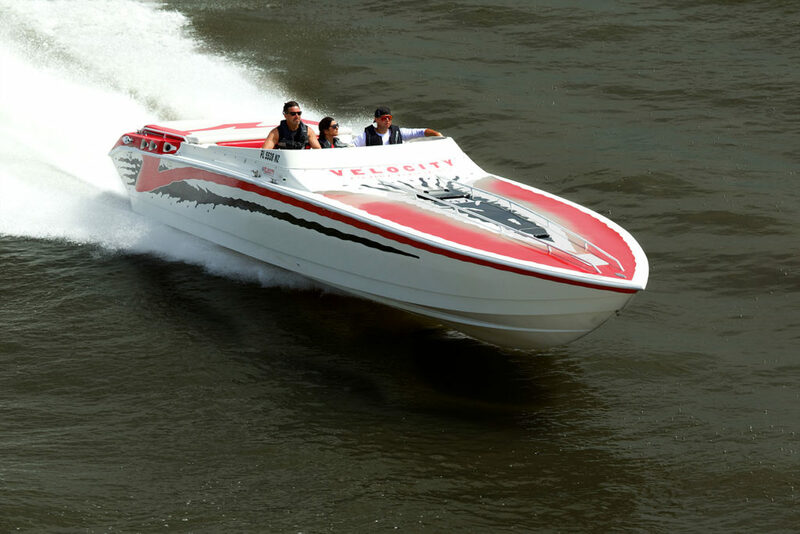 Among his Garden State buddies, Del Flores, a 46-year-old mechanical engineer who lives in Brick, N.J., and owns a Velocity 390 sportboat, tends to be the man with the plan. Loosely translated, that means his friends always look to him to organize weekend fun runs, lunch runs, raft-ups and so on during the boating season. And as a former motorcycle event and stunt show organizer, Flores is more than happy to take on that role. Truth be told, he’s good at it, likely a lot better at it than his ever-grateful friends would be if cast in the same role. But last weekend, Flores took his efforts to another level with his first organized Spartan Powerboat Club fun that attracted—as reported on speedonthewater.com— 35 boats. New Jersey’s Del Flores has taken his passion for go-fast powerboating and penchant for organizing events and created the Spartan Powerboat Club. Photo by Tim Sharkey/Sharkey Images. When I spoke with Flores the day before the run, he said almost 30 people had expressed interest in the 20-mile Sunday jaunt from Barnegat Bay Marina to Joey Harrison’s River House restaurant for lunch before returning to its starting point. He also told me he’d be “really happy” with 15 performance boats in the fleet. Instead, he got 38 catamarans and V-bottoms filled with more than 150 enthusiastic participants. “I was sitting there, looking at boats starting to pour in and thinking, “Shoot, stuff just got real,” he said. “I was in shock. I never got nervous or anxious because all the people involved handled themselves really well, but I was amazed. I had made 27 card packets thinking I would have to throw half of them away. I ended up making up another 10 packets. I actually ran out of cards. The instant success of Flores, who plans to organize three events next summer, reminds me of the success enjoyed by Chris Dekker, Jeff Tibbe, Kevin Alferink, Derek Powers, and Roger Zuidema, the guys who started West Michigan Offshore—a nonprofit organization of high-performance powerboat enthusiasts—in April 2015. At their core, they’re just like Flores, simply a bunch of like-minded, enthusiastic guys who enjoy nothing more than running alongside one another in their boats and socializing off the water when things slow down. Limiting itself to just four major events, West Michigan Offshore just finished its third successful season this year—just one more event than Flores plans to have in 2019. Clearly, this pair of East Coast and Midwest “grassroots” performance-boating clubs is on the rise. The organizers have the off-season to plan their 2019 seasons, and they have plenty of momentum based on this year’s successes. Will they inspire others to start clubs of their own—and maybe attract sponsor support—around the country? Don’t bet against it. Matt Trulio is an award-winning journalist who has covered the high-performance powerboat world since 1995. He wrote for Powerboat magazine for 17 years and was the magazine’s editor at large until it ceased publication in 2011. Trulio is the founder, editor-in-chief and publisher of speedonthewater.com, a daily news site that covers the high-performance powerboat realm. He’s also the former editor of Sportboat magazine. 7.4 Mag IAC/Fuel Pres Reg Replacement Intake Removal? Jose Fernandez RIP. What the heck happened?